SKU: ThermoPower-VDF20. Category: U-Pipe Evacuated Tube Solar Collectors. All systems have been tested under the highest quality standards in order to ensure the longevity of your solar heating system. If you are unsure of where to start or if you require guidance with your solar hot water heating system please feel free to contact a solar hot water specialist at 1-888-SOLAR-11. 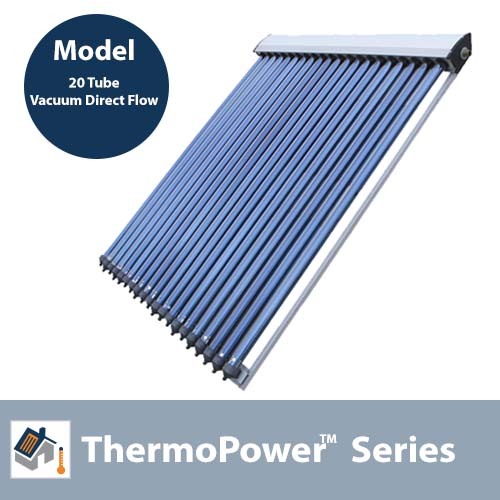 Vacuum Tube Solar Collectors are extremely efficient and cost-effective particularly in colder climates where other Solar Collectors suffer from limited performance and other problems due to their lack of freeze protection. Vacuum Tube Collectors unlike others are extremely freeze protected leading to efficiencies of over 70% even in freezing temperatures. The unique design and collection properties of these collectors make them exceedingly efficient even in low-light conditions which is another definite advantage during winter. SunMaxx Vacuum Direct Flow Solar Collectors are among the most affordable cost-effective solar collectors available on the market today.